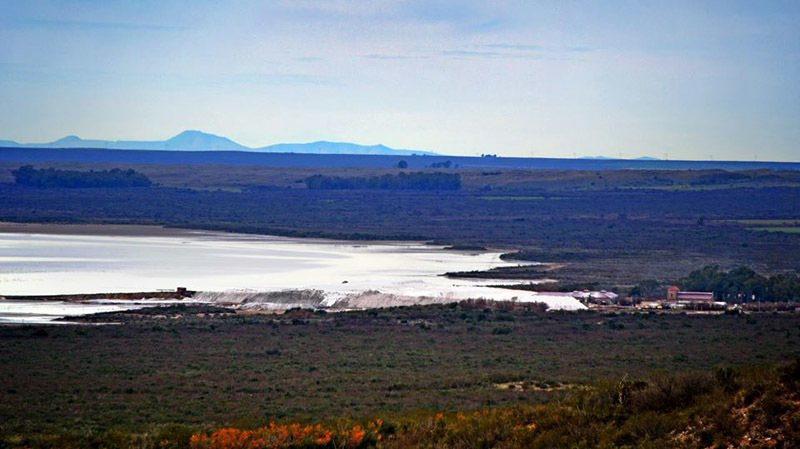 There were three salt mining areas along the route of the BAGSR's Neuquén line. Technically, being in La Pampa and Buenos Aires provinces, they are outwith the boundaries of Patagonia proper. However, they are included here for interest. 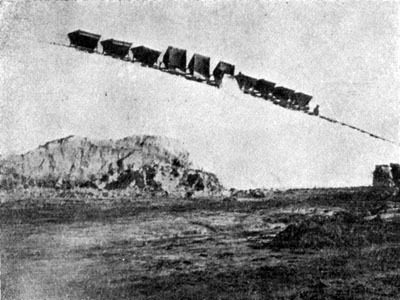 Most of the information about these three sites comes from Señor Jorge Waddell's article on the industrial railways of the Neuquen route in Todo Trenes no. 32 (2), with locomotive details from the late Reg Carter's publication on The Industrial Railways of Argentina (1). Señor Anzoátegui was a Uruguayan entrepreneur who had developed salt and timber interests in La Pampa. From 1918 onwards he developed the El Chancho salt pan, eventually building up an 80km network of broad gauge branches worked by FCS locos and stock. These radiated out from the FCS station named Anzoátegui. 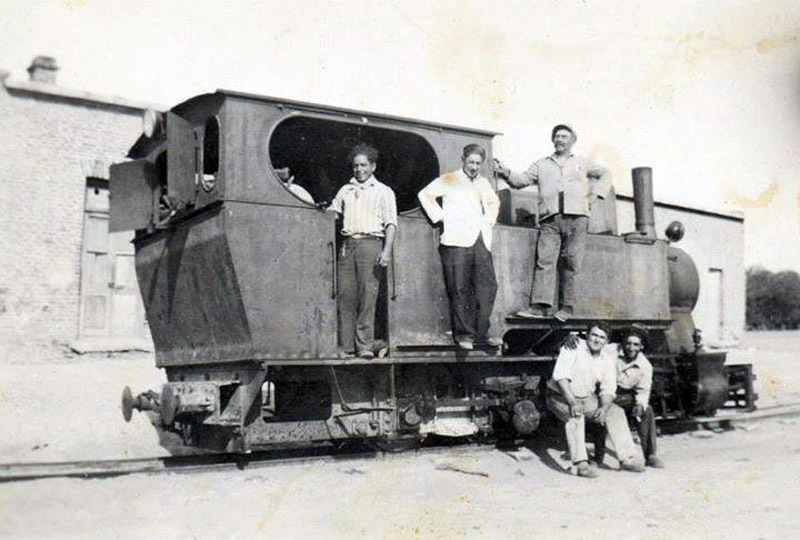 Anzoategui's company, the SA Salinera, Forestal, Agrícola y Ganadera, may also have had two petrol engined shunters of its own. These are supposed to have been four-wheeled locos by Baldwin, built in 1918 for the US Army (13). There was also a 60cm gauge network in the salina, using 100 wagons and a Baldwin loco from the decauville lines in Buenos Aires province. As well as these railways a cableway was also constructed. Anzoategui's 60cm gauge skips dump salt on a big tip in this view from Arturo Coleman's autobiography. The broad gauge activity lasted until the late 1960s by which time two ex FCS locos, an 11A and an 11B had been acquired. A 60cm gauge line (4) was built by Señor B. Graciarena from the FCS station later named Nicolás Levalle. The motive power at the start in 1908 was an O&K 0-6-0T, later joined by two other O&K or Krauss locos. Later an assortment of internal combustion locos were used, including. Brookville BCL no. 3151 of 1946, a 10 ton diesel mechanical purchased new. Brookville BCL no. 3305 of 1947, an 8 ton diesel mechanical purchased new. Brookville BCL-H no. 4603 of 1960, a 12 ton diesel mechanical purchased new. Ruhrthaler, no details known, purchased new. Note how the engine is fitted with buffers. Whilst the successor company still operates, the railway was abandoned in the 1980s though an O&K loco is preserved on site. BCL no. 2319 of 1938, a 7 ton diesel mechanical. BCL no. 3044 of 1946, an 8 ton diesel mechanical. BCL-H no. 4911 of 1963, a 10 ton diesel mechanical. BCL no. 5202 of 1966, a 10 ton diesel mechanical. BCL no. 5203 of 1966, a 10 ton diesel mechanical. BCL-TC no. 6101 of 1975, a 10 ton diesel. BCL-TC no. 6102 of 1975, a 10 ton diesel. BCL-TC no. 6107 of 1975, a 10 ton diesel. The photo below was taken about 1990 (3). 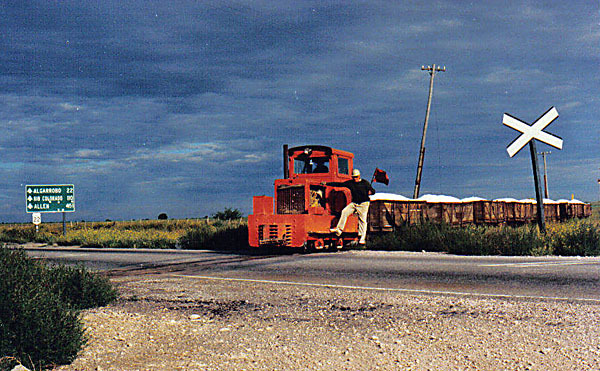 It shows a four-wheeled Brookville diesel hauling a number of bogie wagons laden with salt across a public highway (Ruta 22, the main road west from Bahía Blanca to Neuquén). A number of other photos taken at the same time are available on the next page. 1 Industrial Railways of Argentina (a list of all known locos). revised 1998. Reg Carter. Duplicated, spiral bound. 46 Mill St., Kingston upon Thames, Surrey, KT1 2RF. UK. 2 Los Industriales de la vía Neuquén. Jorge Waddell. in Todo Trenes no. 32, 2004. Buenos Aires. 3 The 1990 photos of the Salina Las Barrancas were provided through the kindness of Señor Ruben Marcelo Rabina, the administrator of the 'Trocha Angosta - Modelos y Prototipos' e-group. 4 Señor Hector Guerreiro writes that the Salina La Aurora railway was of 60cm gauge rather than 75cm as originally thought. 5 Found on Facebook, Carmelo Haag (10/7/16, no longer available). 6 Found on Facebook, Salina La Aurora (28/10/15, no longer available). 7 Found on Facebook, Museo del Trabajo Nicolás Levalle (28/10/15, no longer available).